The strong breezes that begin to flow in the online servicing sector have turned into a full-fledged storm with the introduction of on-demand apps. The users feel blessed because they no more have to squander their time anymore for availing even the common day-to-day services. We keep on hearing that the mobile app industry is going through a revolutionary phase and that no trend is stagnant here. But certainly, the on-demand apps can be counted as an exemption. The escalation of on-demand services have motivated many young budding minds and paved the foundations of various successful start-ups globally. According to a research, the on-demand economy has reached somewhere around $57 billion by the end of this year 2017. Furthermore, According to research, about 82 million Americans are widely using the on-demand apps, where around 45 million Americans are offering the on-demand services. The on-demand applications literally serve a wide spectrum of customers and their needs. In this age of technology, people are keen to make their life convenient and surely, the on-demand is a positive initiative in this perspective. The key factor that goes in the favor of on-demand apps and makes it exceedingly popular is the fact that it aims at solving a common problem, related to daily life. Hiring a cab for office, booking an appointment with a doctor, calling a pest cleaner to clean the house, sending dirty clothes to a laundry, grooming your skin and body, and many more; all these services fall within the category of on-demand apps. Yes, it is for certain that the on-demand apps are a boon for both the users as well as the business entrepreneurs. Therefore, there shouldn’t be any hesitation when you are planning to invest in such a great asset. What’s the Big Deal for Business Enterprise in Investing on On-demand Apps? Gone are the days when the business owners and retailers would maintain every record and data in files and sheets. With on-demand apps digitizing the entire process, you don’t need to keep up manual information. With the initiation of Delivery Management System or DMS, you can automate the workflow of your business and save lots of time and money. 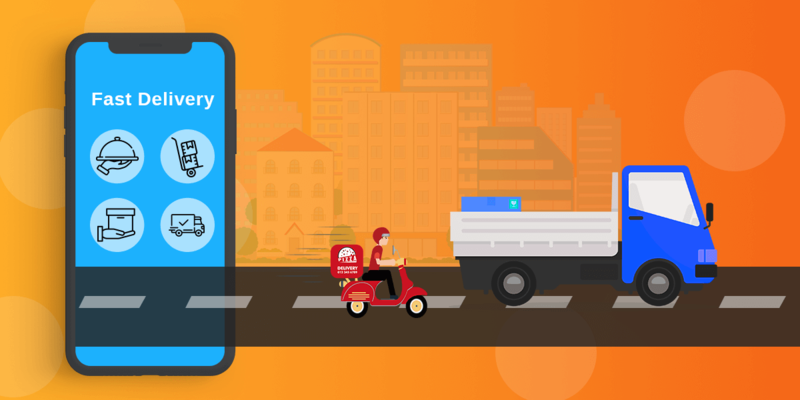 The on-demand apps also help the business entrepreneurs to keep a watch on the whereabouts of the product and driver using the geo-location and GPS facility. They would know how much distance the driver has traveled and at what approximate time he would deliver the item. Since the on-demand apps are integrated with the GPS benefit, you can indicate your drivers with the easiest and shortest route when they set out for delivering products. You can save them from taking the busy roads and avoid the traffic snarls. Since you have to maintain a stock of goods, therefore an efficient order management is necessary. You have DMS helping you to know which stocks of items are in sufficient and those that are falling short. You don’t need to employ any person for maintaining such records. With the increase in the numbers of on-demand apps, the level of security and scalability has also ascended. Today the App Development Companies have been able to win the trust of clients because of providing improved security specifically while implementing the payment gateway. The emergence of the on-demand apps has generated opportunities for youngsters aspiring new job. For instance, cab booking apps like Uber or Ola are hiring drivers and paying them salaries. The employees associated with the different types of on-demand industries are satisfactorily working with the same organization. According to a research, 70% workers have expressed their satisfaction over their job status, while 81% have said that they would continue to work with the same industry over the next year as well. If you can better strategies and run your business well, there is no way that can stop you from getting the best return on investment. We have number of examples that have become an inspirational story for the others. The benefit of price affordability will not only influence the customers but will also impact your business as well. It simply means more customer retention and that the users will return to your app if they get the item within the budget-friendly price. Let’s now analyze what the end-users gain from installing an on-demand app in their devices. The biggest USP (Unique Selling Point) of on-demand apps was their swift service to their customers. The customers get the services in real-time and they don’t have to follow the old traditional methods such as waiting for the service provider to arrive per his will. This literally saves a lot of time. The customers can choose to avail the required service at a time, which they feel more convenient. For example, in the case of grocery apps, the users can schedule the time of delivery at which the items would be delivered. The users can view their order summary and track the status of their online order. They receive the notification regarding the status of their order. Cost efficiency is one of the other major reasons why consumers today are getting more attracted to on-demand apps. This is also due to the fierce competition in the market. The on-demand apps facilitate the customers to choose their preferred service provider based on their experiences. If the customer was literally satisfied with the services of the provider, he can opt for the same company or if he wants to go for a change, he has the full freedom to do so. However, most of the users these days choose a provider based on their ratings and reviews. As said the importance of ratings and reviews has significantly increased as customers basically choose a service. The more positive reviews the app receives, the more traffic it gains from the potential consumers. The on-demand apps are offering the 24×7 customer support with the help of future-based technologies such as Chabot. The users get replies of their queries in real-time through a virtual assistant support for which no human interaction is required. Not only the consumers receive a wide spectrum of selection on varied products and brands, but they also get to choose the different payment options. With the payment gateway integration, the customers can go cashless where they can make payments using their credit, debit and internet banking. This is much faster and convenient. The on-demand apps are on discount and offer mode perhaps all throughout the year. The rewards, coupons, and cash backs are something that instantly entices the customers to go ahead with the deal. This is quite important from business viewpoint to keep your customers engaged. Alteration is the primary nature of the technology. As the trends are changing, we are witnessing the initiation of new business solutions and services propping the market. However, the future of the on-demand apps and economy is illuminating the exceeding to a higher scale. People who seemed to get bored of the traditional brick and mortar stores are looking to explore new ways to venture out in business. As the on-demand app industry has already spread out its branches each one is posing a lucrative prospect. How to Develop a Currency Converter App?